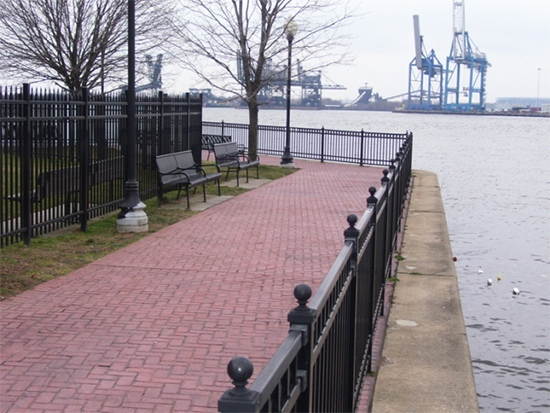 Gloucester City, Camden County, NJ – Gloucester City enhance its Delaware River waterfront with a 1,300 feet long, 10 feet wide stamped concrete walkway, extending from the existing waterfront senior citizen apartment building and wrapping around Gloucester City’s Freedom Pier. 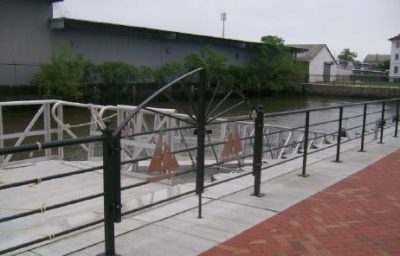 This Green Acres funded project will allow residents and visitors over 3,000 total feet of walkway along the Delaware River, with access to the existing marina and the many activities Gloucester City has along the waterfront during the summer months. Work completed by CES included design and specifications for the installation of concrete and brick sidewalk, decorative fencing, benches, trash receptacles, solar powered lighting, and pedestrian ramps.